This is a flavourful and delicious chicken gravy recipe from my mother. Murgh Dahi masala or Chicken and curd gravy needs few ingredients and is very easy to make. 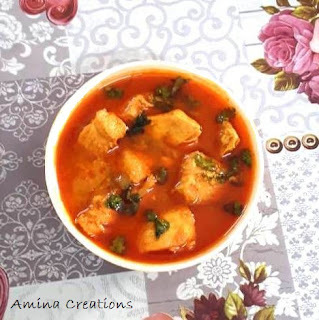 This curd based gravy can be served with both rice and chapathi. You can also visit the Chicken recipes page for more chicken recipes. Take curd and salt in a bowl and mix well. Add the chicken pieces, mix well with the curd and allow the chicken to marinate for 2 to 3 hours. Heat oil in a pan, add onions, cardamoms, cloves and cinnamon and saute for a few minutes till the onions turn golden. Now add garlic paste and ginger paste and saute for a few minutes till the raw smell goes. Now add red chilli powder, turmeric powder and stir for a few seconds. Then add the chicken along with the marinade and mix well. Add 1 cup of water, coriander leaves and bring the gravy to a boil. Once the curd and chicken gravy is cooked, switch off the gas and transfer the gravy to a serving bowl. Seems delicious, will love to try. yummy lipsmacking gravy..looks tempting !